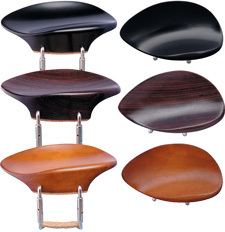 We offer a large selection of Chinrests. 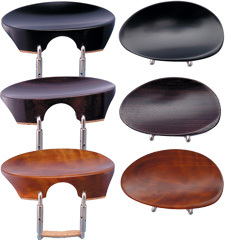 Our chinrests are made in India, using high quality wood and hardware. 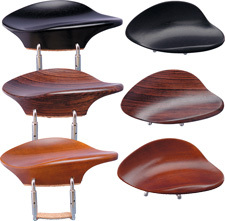 Many companies make each of the models, so you can not directly compare price and quality just by the model name. 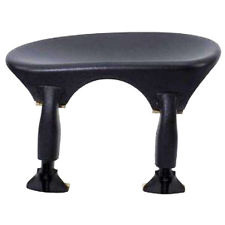 Yes, there are lower cost chinrest on the market, but they are not the same quality as we offer. 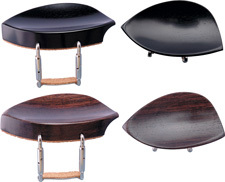 For Chinrest accessories such as Strad Pad, Please visit our Miscellaneous Accessories pages. Consider ordering a few models to try, and then contact us to return. 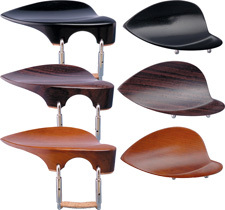 Also, consider different shoulder rests. 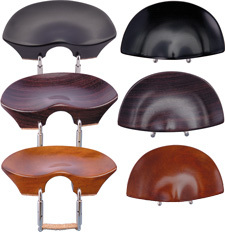 A change in your chinrest, may necessitate an adjustment to the shoulder rest, or a different shoulder rest product. 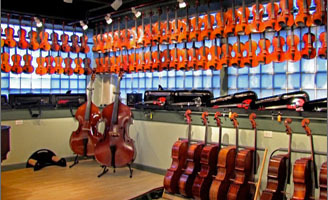 Our most recommended and popular models are the Wittner Ultra, Guarneri, and Flesch Flat models. Popular side-mount style. Low, with a shallow cup. Probably the world's most popular chinrest style. Mounts centrally, with a large cup off to the side. 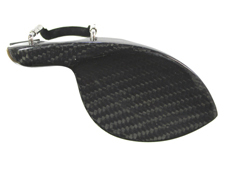 Most players set their jaw over the tailpiece portion, using the ridge as an anchor for secure support. Just like the standard Guarneri model, but with upgraded hardware. Shaped like Guarneri, but ultra light weight. Center mounted like the original Flesch, but flat on top. 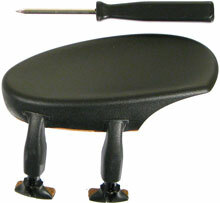 Hypoallergenic composite material, and a smoothly contoured mounting bracket design, make this chinrest a top seller. Wittner spent many years developing this design. Extensive testing was done. Same features as the side mount model, but with a higher overall height, and center mounted position. Mounts centrally and has a large plate and sharp ridge similar to Ohrenform. Center mount, with large, deeply contoured cup, and a pronounced ridge for the jaw to anchor. 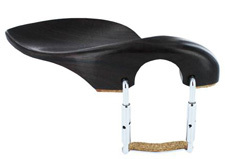 Similar to Guarneri, but with a more-rounded shape over the tailpiece. Tall side-mount. Steep rise over the tailpiece. Side mount, high plate, with a high, sharp edge to catch the jaw. Very low cup, with a slight rise near the tailpiece. 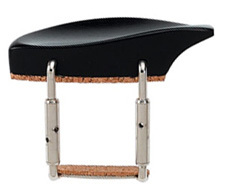 A tall side-mounted rest, with a steep rise over the tailpiece. The high, deep edge has a smooth contour, and the cup is quite deep with a rise in the back. 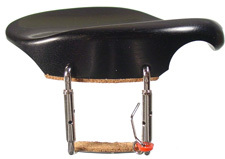 Side mount, with a protruding section over the tailpiece. Flat, with not much of a ridge. 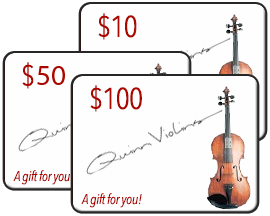 Another slight variation of the Guarneri design. Flatter cup, with a strad-like roundness over the tailpiece. 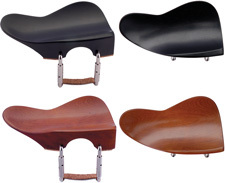 Top seller for low, side-mounted chinrest. Very low, side-mounted plate which is flat and has a small ridge. The lowest, flattest chinrest available. Side mount. A low, side-mounted plate, with more depth than others of this style. A very low, side-mounted plate, with a deeper cup than others of similar style. Center mount, with a shallow, smoothly contoured cup. Side mount, high plate, with slant in the other direction. Center mounted, with a cup shape like the London model. Overall, it is higher, though, to clear the tailpiece. Another variation of the Guarneri style. Low and flat. Mounts to the side of the tailpiece. Center mounted, with a hump over the tailpiece. No other model is anything like this shape. Models like this often make contact with the tailpiece. A luthier can carve some wood away from the under side, or additional cork material can be added to increase the clearance slightly.